Description: First time I saw this engine, looked good when new to NYSW. Utica crew went back north after exchanging cars with the Binghamton crew. Description: NYSW 2012 works at Binghamton, getting its train together for a trip up the Utica side, which was the busier line in those days. The ex Auto Train car to the left of the diesel served as the NYSW yard office. Description: The NYSW seemed to spend a lot of time working the Binghamton yard, despite running what seemed like very few trains-though they did work the Utica side almost daily then. Here one of the home road units gets some help from a D&H unit as it works at QD. Description: GP 38 2012 arrives at Sherburne and will swap cars here with UT 1. Both will work the pet food mill. Description: Theres no work at Oxford, and BH 1 hustles past the old DLW freight house as it makes for Binghamton. Description: The 2010 and 2012 have swapped trains. BH 1 now switches the pet food mill, and will shortly head south. Description: A scene that would become a memory in another 20 years, BH 1 works at Greene. 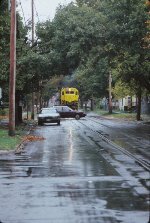 Floods in 2006 would cause numerous washouts, putting the line south of Norwich out of service. Note the D&H covered hopper at far right. Description: BH 1 starts a trip on the Utica Branch, passing the Agway mill on the ex DLW line. DLW had a yard here years ago, YO, which was by this time a weed covered field. The cars at left are grain loads for Agway, a Conrail customer. Grain in boxcars was still a common sight here, including a few Erie cars still in service. Description: BH 1 crosses the Chenango River in late afternoon lighting. This train always seemed to get out late in the day, and could be hard to shoot here, since the orientation of the bridge made mid afternoon light a problem. Description: BH 1 was dodging the shadows by the time it got to Chenango Forks, but I was able to get this shot up near the NY 369 crossing. Description: Just about the end of useful light, but the sun is still high enough to highlight the trees, which are peaking as the train passes through Greene. Description: Any NYSW power could show on the trains they ran for the D&H, though it tended to be the 6 axle power for road trains as a rule. Today we see GP38-2 2012 leading MEBU into East Binghamton on a day that anyone with sense would have stayed home. Description: BH 1 has completed its work at Rubbermaid and is now working the sidings at the old DLW freight house, the edge of which is seen at far right, which is used to hold cars for Rubbermaid, and also for Agway, which has a feed mill a couple of blocks north. Description: For many years, Rubbermaid had a plant in Cortland. They received plastic pellets via rail, though most if not all of their outbound traffic went by truck. BH 1 is working a cut of covered hoppers into the plant on a cold day in December. Despite the gloomy weather, the engine looks festive. That's the ex DLW passenger station at right. Description: BH 1 has a car for a customer south of downtown, and is seen crossing Court St, having left the rest of his train up at Rubbermaid. The crossing tower up near the station is visible above the train. Description: Almost 30 years after this photo, several railroads have created heritage fleets, honoring their predecessors. This building serves in much the same way, though more through benign neglect that by design. BH 1 works past the old DLW freight station in Cortland as it does some local switching. Description: This pair of engines was sent over to Bevier St to retrieve the new B 40s that were coming in on BUME so they could be set up for service. Description: MEBU rolls slowly down the Buffalo Runner to get onto the Tier, passing the power for BH 1, which will go north shortly. Description: BH 1 was sometimes a maid of all yard work on the downtown side of the operation, working the NYSW yard and also Bevier St if it needed switching. Here we see it with 2012 and an SD 45 on the D&H side, next to the Jordan Spreader that sat there most of the summer. Description: The NYSW was still using a couple of Alcos in local service. The C430 fleet was down to two units, but C 420 2010 kept on. Here it is leading a pair of EMDs past the Binghamton Agway as it heads up the Utica Branch on BH 1. Description: NYSW would sometimes use its own trains to work the D&H Bevier St yard. Here is such an event, with 2012 working on the D&H side. Description: One of the four BAR GP 38s sits at the East Binghamton engine tracks while awaiting its next assignment. Description: BUOI is working Binghamton as BH 1 works hoppers on the siding east of the shop. Description: A trio of units rolls through the NYSW yard as it heads to a siding east of the shop to pick up some hoppers, most likely for a trip to a quarry on the Syracuse side. Description: The trio of units on BH 1 has coupled to the hoppers and will get them going north in a while. Description: MEBU has left East Binghamton, and is now passing the NYSW shop downtown as BH 1 works with a trio of 4 motors. Description: Poor light was not unusual in the Southern Tier-it rained a lot here-and most of us shot photos in it anyway, since you often got some interesting consists, even if it was raining. 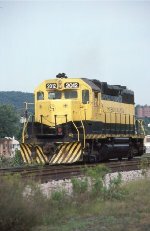 Heres one of them, a BH 1 with a C420, GP 18, and GP 38, something you could find only on the NYSW. The train is northbound at Phelps St. Description: This view from Chenango St shows the layout of the yards in downtown Binghamton. At one time, this was all Erie, then EL. After CR sold the Syracuse and Utica lines to NYSW, they got the north side of the yard, at left where 2012 is working a cut of hoppers. Conrail uses the part closer to the ex EL main, at right. You can see the CR power for WABH 11 in their yard. The former D&H station, unoccupied at this time, will in another 16 years become the NYSW base of operations here. The Buffalo Runner runs alongside it. Description: RPPY rolls slowly through BD behind an odd assortment of power as the snow intensifies. Just another winter day on the railroad. Description: HAN 2 is pulled up on the Buffalo Runner waiting for a new crew. Conrail would not let NYSW change crews on the main most of the time, so they had to either pull up the runner at QD for eastbounds, or back the train into the CP yard for westbounds. Todays train has an SD 45 and GP 38 for power, so there may be some diesel shuffling going on as well. 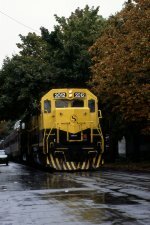 Description: NYSW 2012 leads this NY 7 into Binghamton. While NYSW was not above using small power on road trains, the long hood first orientation of 2012 makes me think the stack outlawed before it got to Binghamton, and it was sent out to retrieve the train. You never knew what to expect from the Susuie Q. The 2012 leads a trio of SD 45s as a set of CP power sits on the 2 runner on the ex DLW in the distance. Description: BH 1 works in the yard as it switches cars from the Utica side.